The debut album from YouTube star Troye Sivan features collaborations with Betty Who and Broods, and was preceded by the single Wild and an eponymous EP. WILD: The lyric "cause when you look like that / I never ever wanted to be so bad" is so understated. It's simple, and though Sivan's delivery is stone cold, the desire is cutting. It's bouncy, sleek and simply enjoyable. FOOLS: Here Sivan sounds emotionally constipated here; he just lacks the natural skills of a singer, and has to rely on blatantly teenage lyrics and smooth synths to make his point. Fools is perfectly adequate, with no terribly egregious qualities, but nothing worth remembering. EASE (f/Broods): The first verse is perfectly teenage. The lyrics are so sweet in the chorus, but Troye sounds so distant, and even pained as opposed to comforting. Again, the production is doing most of the work here. TALK ME DOWN: This ballad comes a bit too soon: the dramatics here feel wildly out of place at track No. 4, especially after the first three tracks. This has potential, but this song needs plenty of support, and though Sivan sounds willing to provide it, the song just ends up having an identity crisis, with banging drums under "I wanna hold hands with you." COOL: This sounds like the area Sivan should focus more on: these nonchalant, confident grooves work with Sivan's vocal (since he has proven inept at handling other emotions). That being said, the BPM range in the first half of the album has varied by about 10 so far, and holding out hope for any dramatic changes in that seems unwarranted, creating an overwhelming anticipation for suffocation in the latter half. HEAVEN (f/ Betty Who): This is... genius? One of the first instances of Sivan using the pronoun "he" for his romantic interest, coupled with a female vocalist singing the same is a beautiful juxtaposition. The nostalgia here is tangible, and though there could be a tad more longing in the vocal, and some lyrics are clunky - "the truth runs wild like a tear down a cheek" - Heaven is an instant standout. YOUTH: How did we get from Heaven back into the same close-minded conceptual framework as the first four tracks? Yes, we get it, you want to be young forever and run away forever with your lover, cool. Find a less blatant cliché to express that next time. At least the production is on point as always, and seems a bit fuller here as well. LOST BOY: The dramatic intro gives hope for something different, but the production runs to the same area of radio readiness that plagues the album. Troye sounds too afraid to commit to his emotions, and that holds songs like Lost Boy back from being great, leaving it an acceptable "good." for him. (f/Allday): With the title being lowercase, this song screams "different" before the track even starts. Unfortunately, it's the wrong kind of different. 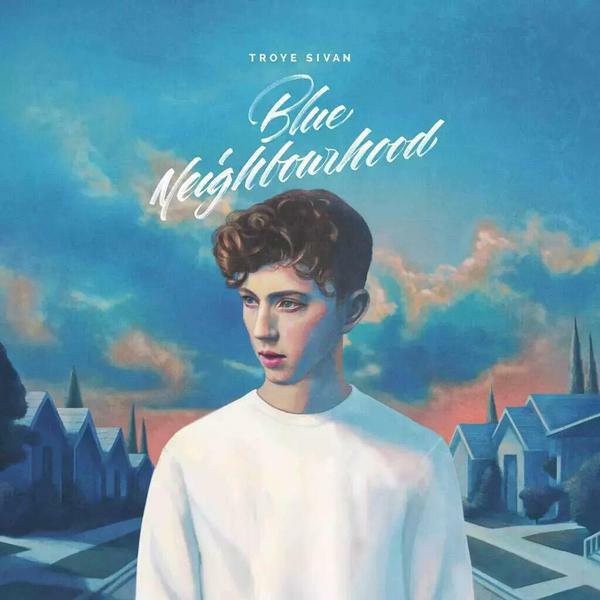 While Troye's departure from the ocean of synths should be marked positively, but this awkward combination of the 2000s pop and 90s R&B doesn't do anything effectively, and is easily dismissible by its sister tracks. SUBURBIA: This is a safe choice for an album closer. Conclusive enough to sum up the album sonically and somewhat thematically, though the "suburbia" metaphor that's supposed to encompass the entire album feels underdeveloped and unexplored. Most of this album feels carried by the work of others: the aesthetic comes straight from a High School junior's Tumblr (a good one at least), the production ends up carrying a majority of the album and the basic Pop song structure is wildly overdone. That being said, Troye choose nothing bad. He sticks to the same formula throughout, and it works. The hooks and blatant desire for radio success should be overwhelming, but Troye's confidence and introverted boldness makes the album work. Make no mistake, Blue Neighbourhood is horribly one-dimensional: but at least Troye choose a good dimension to work with.